The Canon 5D Mark III with the Canon 70-200mm L F2.8 lens pictured to the far left along with the Canon 24-70mm L F2.8 are two of my core go to lenses especially for corporate event photography. Since I have a second Canon 5D Mark III (not pictured), I can use a dual camera strap to have one lens on each side. 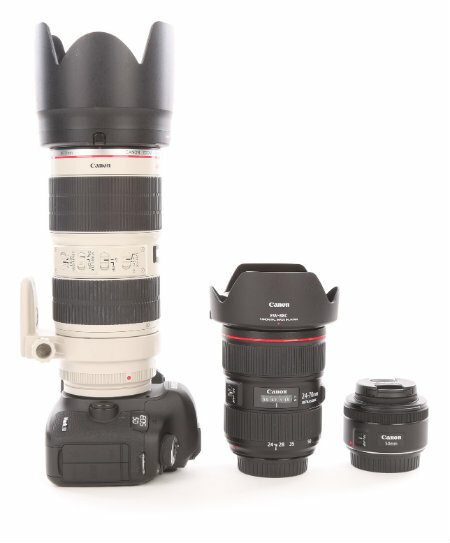 I kept the small lens pictured which is a Canon 50mm F1.8 to give some perspective on the size of professional lenses. However, the 50mm (nifty fifty) is hard to beat for around $125. I got my first real camera for Christmas in 1981 which will be 35 years ago this Christmas. It came with a 50mm F2.0 lens. The core kit lens with film cameras of that time period was a 50mm lens which is also known as a prime lens because it has one focal length and doesn't zoom. Even today, it's a good idea to pick up a 50mm prime to keep in your bag. *Canon has 3 versions: 50mm F1.8 for $125, 50mm F1.8 for $349 and 50mm F1.2 $1,349.